Any manufacturer producing a sub-£299 laptop should be commended for making mobile computing as financially accessible as possible. 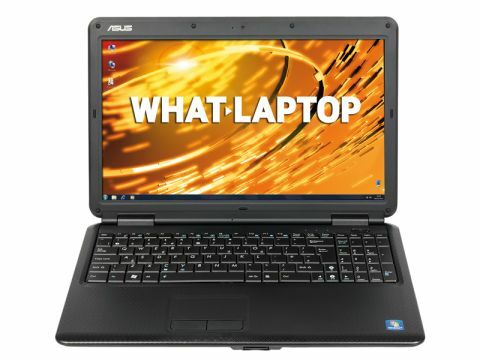 Yet, while the Asus X5DC-SX025V is a very comfortable machine to use, it is largely outperformed across the board by the other laptops of a similar price. Despite featuring 3072MB of memory, the 1.2GHz Intel Celeron 220 processor proved the least powerful against its rivals here. As a result, performance is akin to that of a netbook – a very low-powered mini-laptop – and you'll be limited to running basic applications one at a time. While typing out a document in a word processor works fine, listening to your music at the same time will cause the laptop to slow down. Similarly, the SiS graphics card is the least powerful here by a long way and, while DVDs run fine, photo and video editing is out of the question. If this is a priority for you, the eMachines G420 offers significantly more in terms of graphical performance. The 250GB hard drive is generous, however, and provides room for storing thousands of MP3s and photos, so you'll have plenty to keep yourself occupied with when you're not busy working. Usability is generally impressive. The 15.6-inch screen isn't as sharp as the Acer Aspire 1410-742G25n, but is very comfortable to work with nonetheless. We were pleased by the colour reproduction, suiting those who enjoy watching DVDs on the move. The large keyboard is a little spongy compared to the Acer, but still very usable and we typed for extended periods of time with little issue. A dedicated numeric keypad has also been included, which should please serious number-crunchers. The matt-black plastics employed may not be the most attractive, but they are very functional and pleasingly resilient to dust, dirt and scratches – unlike the Acer's glossy lid – making the laptop suited to the rough and tumble of a life on the road. Unfortunately, the machine provides poor battery life and you'll get just over two hours between charges, which is awful for such a low-powered machine. The 2.7kg weight also means it's not that light to carry, further hindering mobility. The inclusion of 802.11n Wi-Fi is welcome though, and there's also a multimedia card reader which makes downloading photos from your camera, for example, easy.